You are currently browsing the category archive for the ‘Dracut Old Home Day’ category. Through October, 2010, we Attended Twenty Events for SUMMER AND AUGUST, A Cape Cod Murder Mystery since its release on May 30, 2010! The first event for Summer And August, A Cape Cod Murder Mystery was on May 30, 2010, at Yellow Umbrella Books in Chatham, MA, the setting for the story. We returned for Encore Events at Yellow Umbrella Books on July 11th, August 15th, and October 10th. There were two events in June, one at Booklovers’ Gourmet in Webster, Ma and the other was a charity event in Freedom, NH. In July we had four events. Our second visit to Yellow Umbrella Books; Barnes & Noble Booksellers in Nashua, NH; The Toadstool Bookshops in Milford, NH; and The Toadstool Bookshops in Peterborough, NH. We had three events in August. Our second visit to Freedom, NH; The Toadstool Bookshops in Keene, NH; and our third visit to Yellow Umbrella Books. In September we had five events. We were asked to participate at the 10th annual Dracut Old Home Day in Dracut, MA; we did three consecutive days at our favorite fund raiser, for the Wrentham Developmental Center; and Barnes & Noble Booksellers in Salem, NH. Twenty events in five months. What a rush! Tomorrow I’ll tell you how we get to a total of twenty-eight events through December18th. 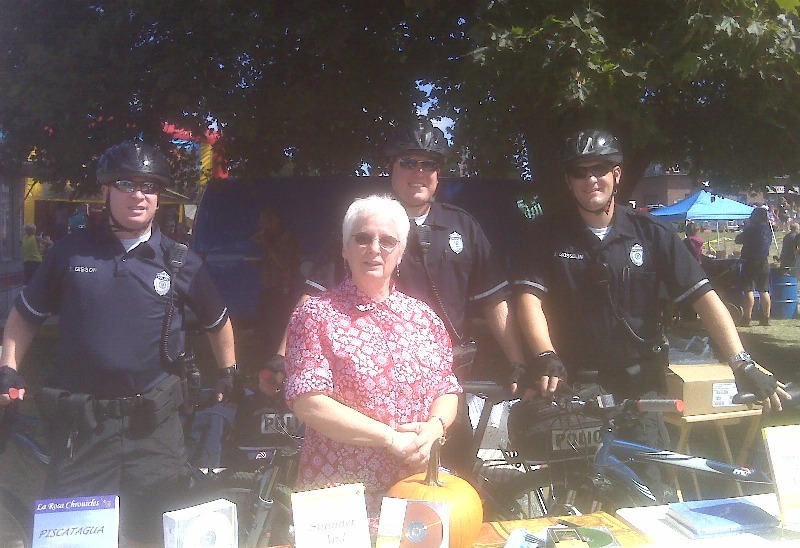 We participated at Dracut Old Home Day 2010, Dracut, Massachusetts, on 9/11/2010. Here I am with three of Dracut”s finest! I Hope officer Rodney from Chatham doesn’t get too jealous. Seriously we sincerely appreciate all those who serve to make us safe. God bless you all! We sincerely appreciate all the new friends we made, many of whom became new readers, as a result of our participating at this event! Special thanks to Dave, Sandy & Ken, for allowing us to participate in this wonderful community event; and for asking us back next year!